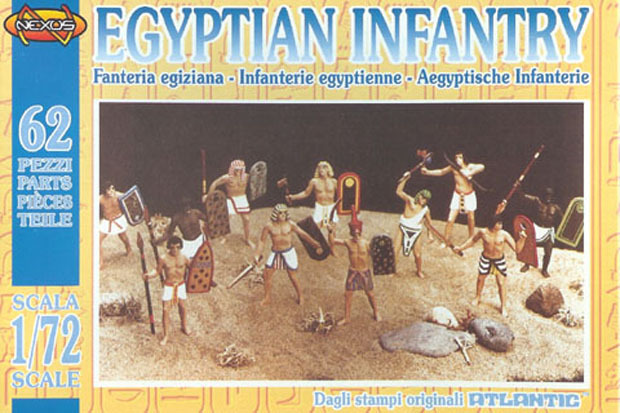 Another great classic, the first kit that for nearly 30 years was the only one of its kind, the Atlantic Egyptian Army!! 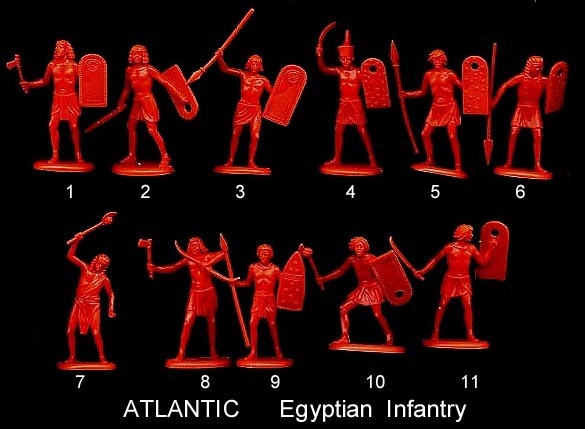 As with all ancient Atlantic sets, the box art is a pic of the painted soldiers, with superb painting skills and a very good selection of colours. The Nexus box just reuses the photo, using it horizontally as Italeri and other manufacturers do today. As with other Atlantic ancient sets, the level of sculpting is nice and high. Detail is sharp and they can be nicely painted, but the figures have some not every interesting poses (too many spearmen just carrying the spear without doing anything with it) and I am still trying to make out what the archer is doing holding the bow in that position at the same time as he carries an axe and having no quiver for his arrows. They also seem a bit skinny and tall, maybe they would be skinny in a bad year for crops, but probably not so tall. All the same, you get a good number of poses, and generally they are anatomically right (at least far more than brands like Strelets, or some Italeri sets with big heads). They are a sort of mish-mash remix of different eras, but overall they are correct, and as the Egyptian empire spawns for 3 millennia I think you could find a spot where all men fit. In our days we would probably demand 3 sets for correctly covering the subject, but back in the 70s and until very recently, you wanted Egyptians and you didn't care about anything more. The worst figure arguably is the Pharaoh. At least this is what we deduct, as he carries the crown of the Lower Egypt. But he doesn't have any sort of armour or fancy clothes, he only carries a sort of sceptre (normally the Pharaoh would go to battle in chariot and he would use either a bow, or a more sophisticated type of weapon), and worst of all, a regular shield like the other infantry. The Pharaoh was quite an important person, and he had commodities such as shield-bearers to protect him, so this leaves this figure as simply a general or somebody of the royal family, who most probably didn't wear the crown (this is furtherly confirmed as Atlantic also made a Pharoah figure ), so you would have to cut his crown to be more historically accurate. 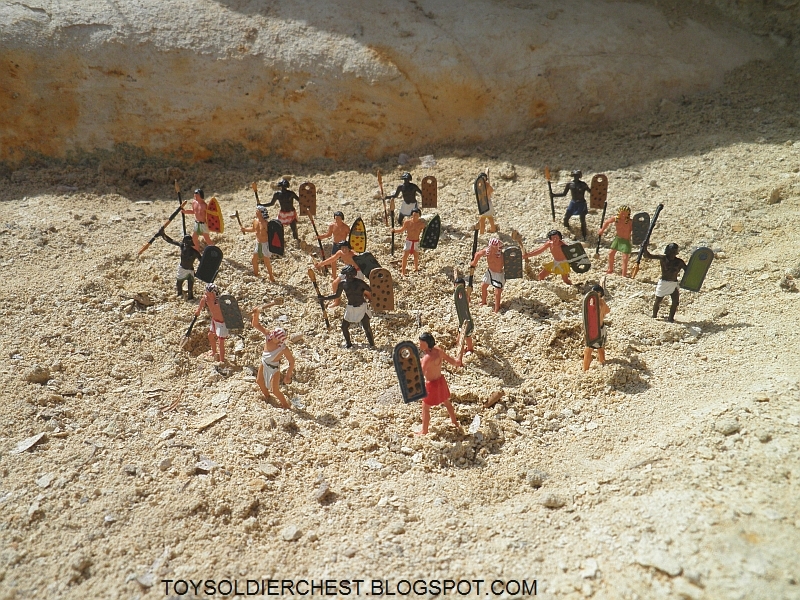 These figures have Egyptian written on their faces, and they can't be used for anything else really. 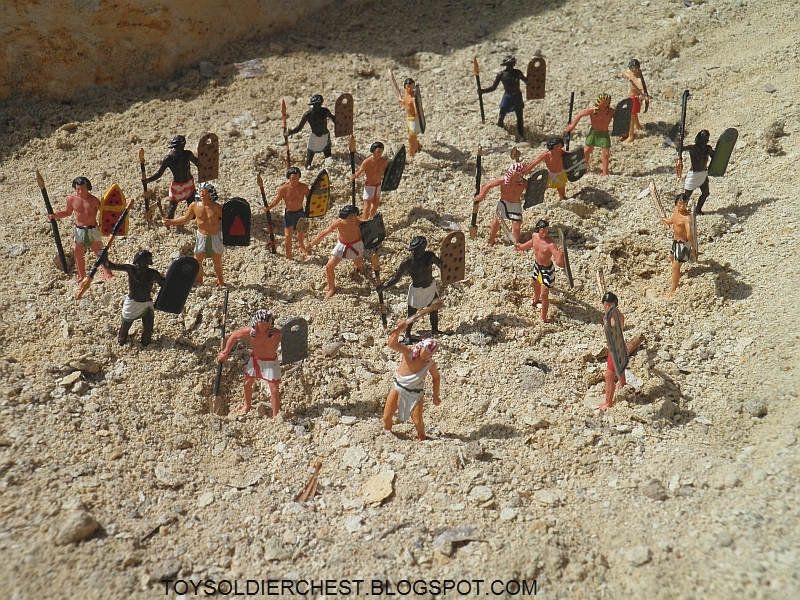 Some of the figures with a bit of modification could be made into Meroe and Aksum infantry, but not much more. They are Egyptians! 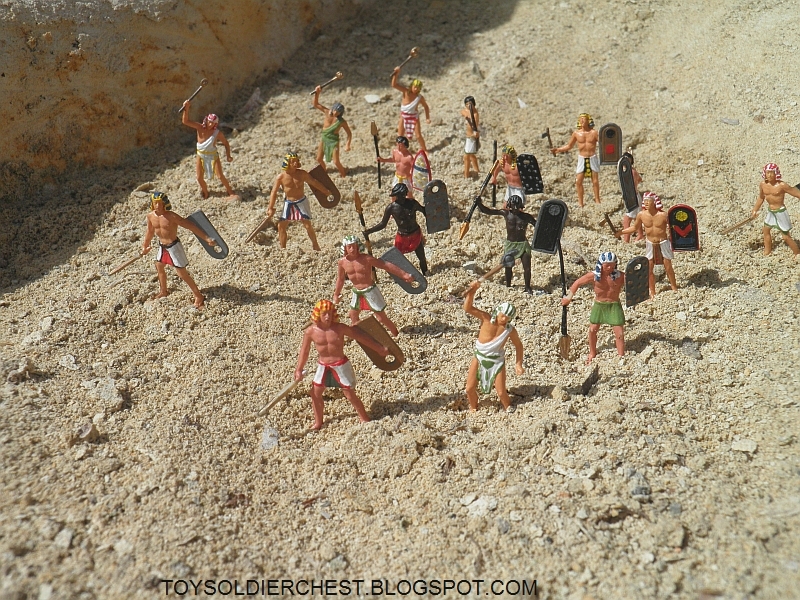 until the Caesar set, they were the only Egyptians you could buy, and from the late 80s until the Nexus reissue, even these were not available. How has mankind survived the lack of 1/72 during so much time? I wonder. Just for being what they are their level of funness is huge. this is a very good set for wargaming. For other unique characters you have the Atlantic At the Pharaohs Court set. Nexus no longers reissues these figures, but all the same by eBay you easily can find the infantry, either the original or reissue, for a very good price, hence the 10.0 score. I bought mine for 9,99 € I think, which for Nexus reissue, that gives you 62 figures, is a great price. Just be alert, and you'll find a second hand lot for roughly 8 GBP shipped. Both the Atlantic and Nexus are not very good to paint or to glue,being flexible and slippery. Note that although they never had flash problems in this set, there is a bit of flash present in Nexus sets, so you will have to cut it, and it is not easy as the plastic is very elastic. 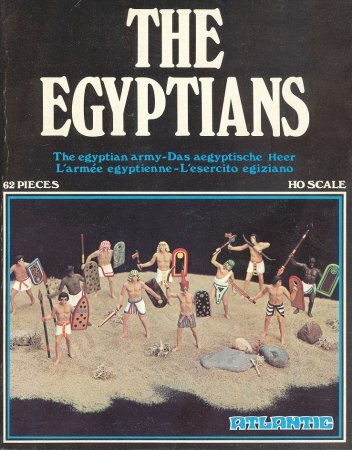 I had lived without any Egyptian miniatures for too long, and these were the answer to my miniature prayings. For me, not having Egyptians was like missing Greeks or Romans, and so I am bit biased in favour of this set, but I think even now, with good Zvezda and Caesar sets, they have a more "Egyptian" flavour in this set than in the others. So even now, I recommend this set over their competitors. 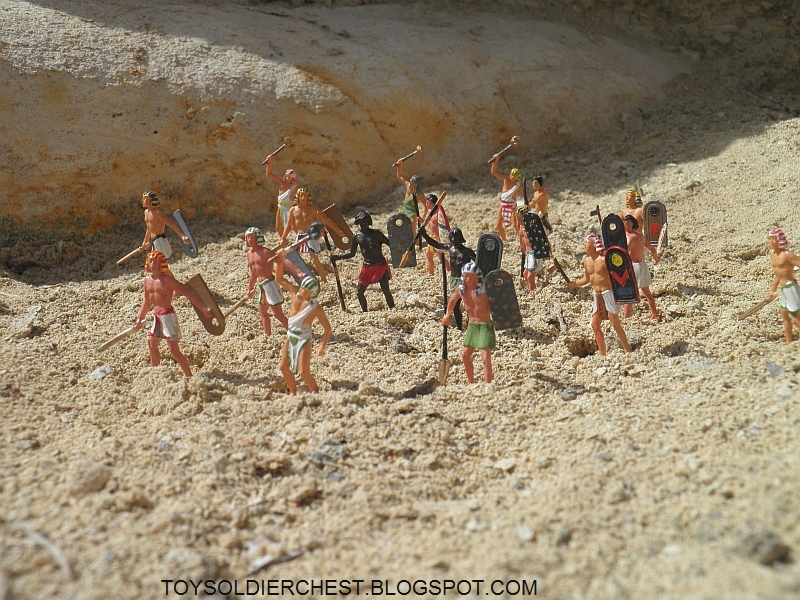 Besides this, the other sets depict the later armies of the Egyptians, so for early Egyptians, this is still the one and only set.